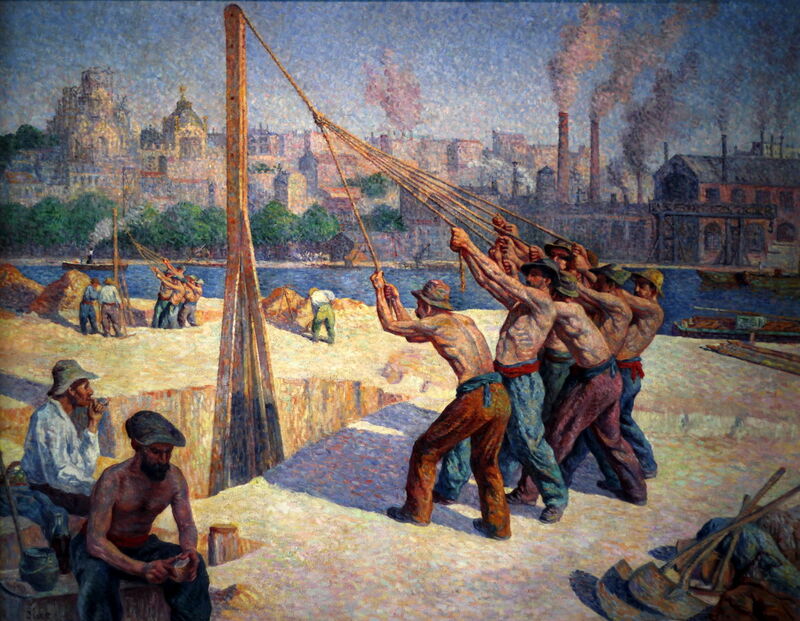 Maximilien Luce (1858–1941), The Pile Drivers (1902-3), oil on canvas, 153 x 195 cm, Musée d'Orsay, Paris. Wikimedia Commons. Maximilien-Jules-Constant Luce (1858-1941) is one of those artists who we have all heard of, but cannot remember where we saw their work. For his paintings are in galleries and museums around the world – Musée d’Orsay holds quite a few of his very best – but seldom do they appear in special exhibitions, or in prominent places. In his long lifetime, he painted more than 2,000 works in oils – rather more than Cézanne – and was an Impressionist, Neo-Impressionist, and Post-Impressionist. But memory of him has faded badly. He was born in Paris, and started his apprenticeship to a wood engraver in 1872, just after the Franco-Prussian War (1870-1). This fired his enthusiasm for art, and he attended evening school, first in drawing, and then starting to paint in oils. In 1876 he moved to work for Eugène Froment, who made woodcut prints for a wider range of clients. He pursued his training in painting at the Académy Suisse and in Carolus-Duran’s studio. Among the latter’s most famous pupils had been John Singer Sargent, who had trained with him just a few years earlier. In 1879 he joined the army, serving in Brittany, and leaving in 1883, when he started painting full-time. The following year he was introduced to Divisionist technique and ‘pointillism’, and his previously Impressionist style changed accordingly. He first exhibited with their group, the Société des Artistes Indépendents, in its spring Salon of 1886. He continued to exhibit in that Salon each year (except 1915-19) until his death. His first solo show took place in Paris in 1888, but consisted of only ten paintings. As a Neo-Impressionist, he was an active anarchist (as was Pissarro and most of the other Neo-Impressionists). However, colleagues in the movement and the influential critic Félix Fénéon viewed his work as being more ‘muscular’ and less ‘cerebral’, in contrast to Seurat’s ‘scientific’ approach. 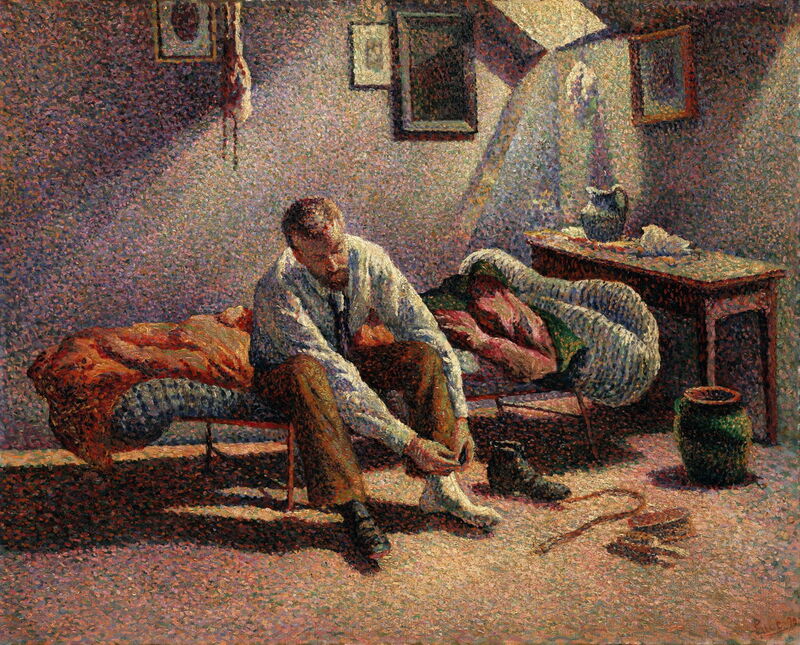 Maximilien Luce (1858–1941), Morning, Interior (1890), oil on canvas, 64.8 × 81 cm, The Metropolitan Museum of Art (bequeathed by Miss Adelaide Milton de Groot (1876–1967)), New York, NY. Courtesy of Metropolitan Museum of Art, via Wikimedia Commons. Morning, Interior (1890) is one of his best-known Divisionist paintings from this period. Although it adheres to the technique of applying small marks of contrasting colours to build the image, Luce’s marks are less mechanical than those seen, for example, in Seurat’s paintings. In places they become more gestural and varied, particularly in highlights. In 1892, he went to London with Pissarro, then later that year went to the south of France with Signac. 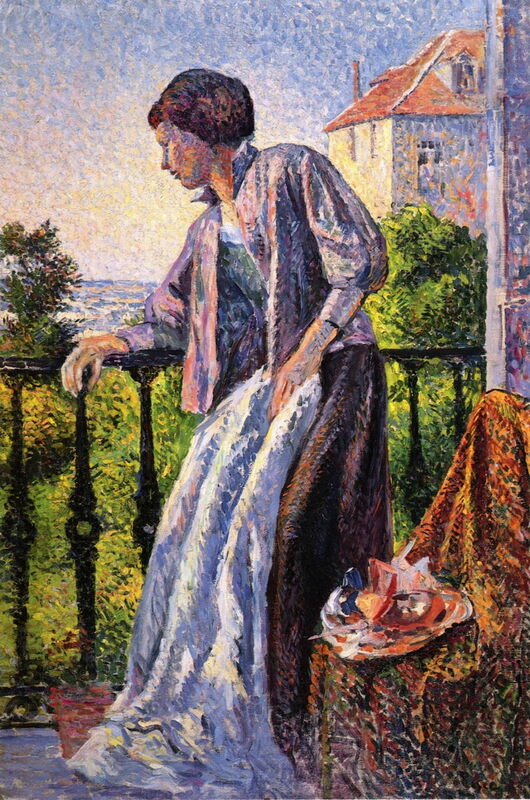 Maximilien Luce (1858–1941), Madame Luce on the Balcony (1893), oil on canvas, 81 × 65 cm, Private collection. Wikimedia Commons. This portrait of his (then unmarried) partner and model Ambroisine ‘Simone’ Bouin, Madame Luce on the Balcony (1893), shows an even wider range of marks, and in parts of the foliage in the background they have started to become organised in the way that was most distinctive in the late paintings of Vincent van Gogh. Sadly, Luce and Bouin did not marry until a few months before she died in 1940. 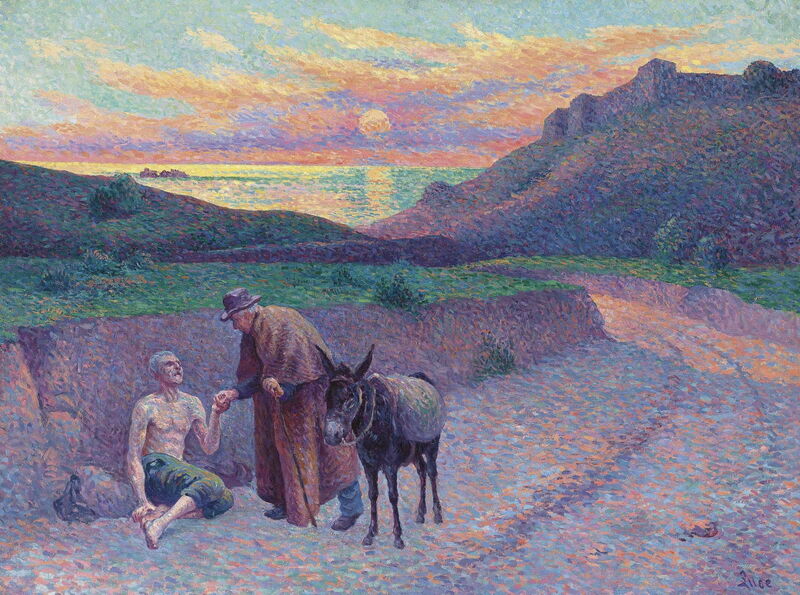 Maximilien Luce (1858–1941), The Good Samaritan (1896), oil on canvas, 76.2 × 101.6 cm, Private collection. Wikimedia Commons. Luce painted in most genres. Although his many landscapes are often beautiful, it was in other genres that he was perhaps most individual and distinctive. In his The Good Samaritan (1896), for example, he combines a brilliantly colourful dusk landscape with a classical narrative painting, showing the parable of the Good Samaritan from the New Testament. This uses an unusual combination of the contemporary with a very traditional donkey. His marks are steadily moving away from pure Divisionism. 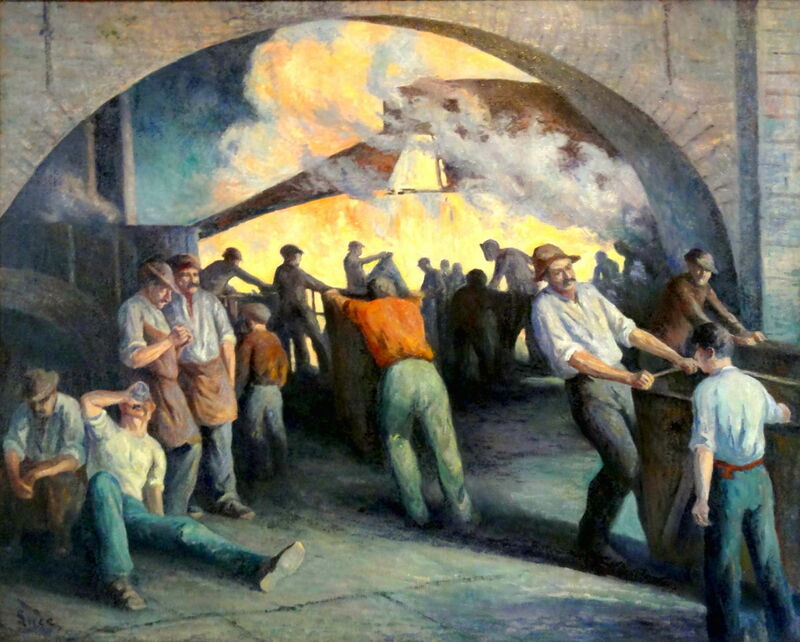 Maximilien Luce (1858–1941), Charleroi Foundry, Casting (1896), oil on canvas, 130 x 162 cm, Musée de l’hôtel-Dieu, Mantes-la-Jolie (Yvelines), France. By Pierre Poschadel, via Wikimedia Commons. By the end of the nineteenth century, Luce’s style had moved on from the slowly collapsing Neo-Impressionist to a more Post-Impressionist approach. His Charleroi Foundry, Casting (1896) shows this well, and is a good example of his many industrial genre works. More than any artist since the days of Philip de Loutherbourg, Joseph Wright of Derby, and others who painted the Industrial Revolution, Luce featured heavy industry and its workers. Maximilien Luce (1858–1941), Industrial City (1899), oil on masonite, dimensions not known, Honolulu Museum of Art, Honolulu, Hawai’i. Wikimedia Commons. Where the famous Impressionists had shown us small glimpses of smoke billowing from the chimneys of factories sprawling out into the countryside around Paris, Luce painted Industrial City (1899) and other works, particularly around the heavy industrial zone of Charleroi, in the ‘Black Country’ of Belgium. 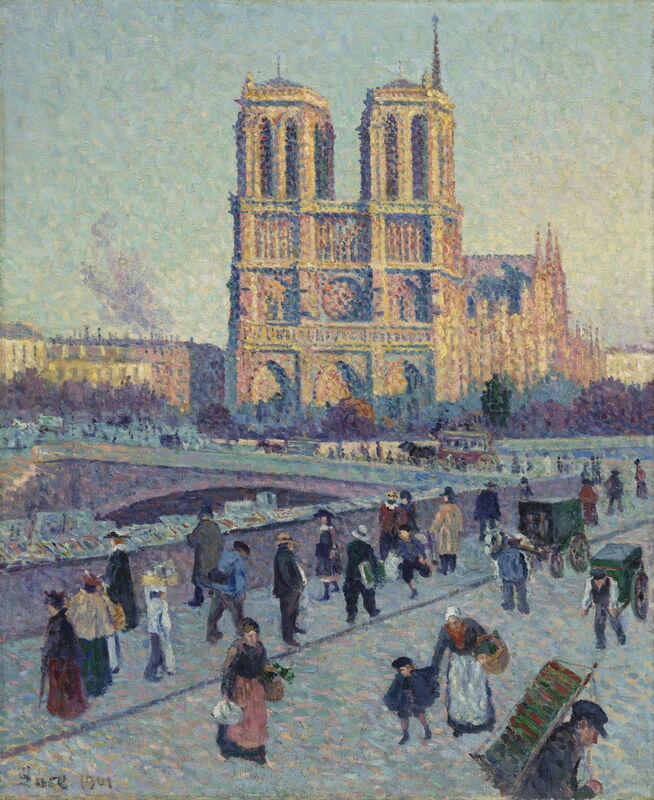 Maximilien Luce (1858–1941), Quai Saint-Michel and Notre-Dame (1901), oil on canvas, 73 x 60 cm, Musée d’Orsay, Paris. Wikimedia Commons. He also painted several views of the cathedral of Notre-Dame and central Paris, of which his Quai Saint-Michel and Notre-Dame (1901) is perhaps the best-known. His city views were usually densely populated, much as Pissarro’s were. Maximilien Luce (1858–1941), The Pile Drivers (1902-3), oil on canvas, 153 x 195 cm, Musée d’Orsay, Paris. Wikimedia Commons. The Pile Drivers (1902-3) is another of his explorations of the working life of the common man in Paris. Construction work in the French capital continued to be very active in the early twentieth century, and Luce painted its many different facets. Note the factories on the opposite bank, infiltrating the surrounding residential and commercial districts. Maximilien Luce (1858–1941), A Street in Paris in May 1871 (The Commune) (1903-6), oil on canvas, 151 mm x 225 cm, Musée d’Orsay, Paris. Wikimedia Commons. Although only a boy at the time, Luce must have retained vivid memories of the Paris Commune which followed the Franco-Prussian War in 1871. He finally committed these into paint in his A Street in Paris in May 1871 (also known as The Commune) (1903-6). By this time his technique had abandoned Divisionism entirely. Maximilien Luce (1858–1941), Construction Site (1911), oil on canvas, 73 x 60 cm, Musée d’Orsay, Paris. Wikimedia Commons. 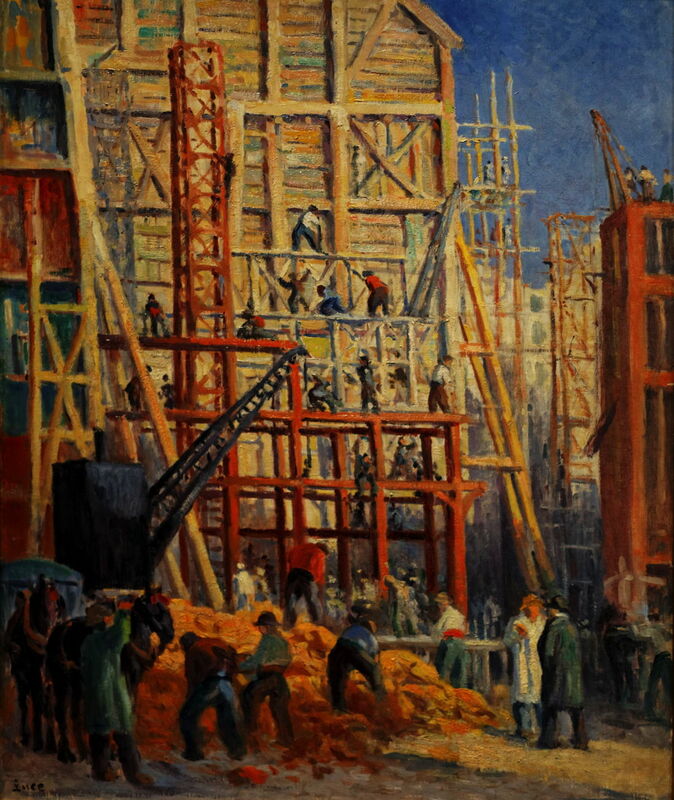 Construction Site (1911) is another depiction of those at work in Paris at the time, and shows the high chroma influence of the Fauves. Maximilien Luce (1858–1941), The Execution of Varlin (1914-17), oil on canvas, 89 × 116 cm, Musee de l’Hotel-Dieu, Beaune, France. 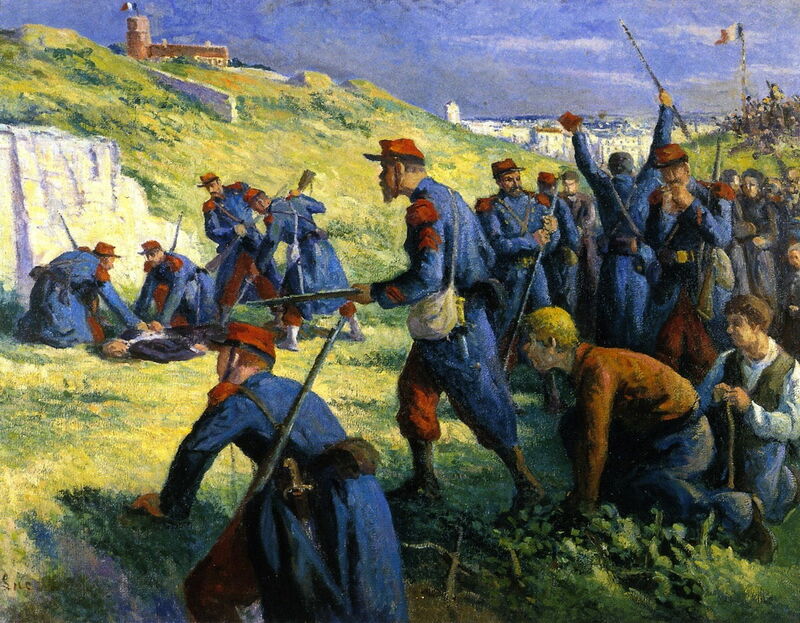 The Execution of Varlin (1914-17) is a second historical painting from the Paris Commune of 1871. Eugène Varlin was a political activist who had started his career as a bookbinder, and become a socialist revolutionary and pioneer trade unionist. During the seige of Paris by the Prussians in 1870, he had distributed aid from his co-operative restaurant. In March 1871, he took part in the storming of the Place Vendôme, following which he was elected to the Council of the Paris Commune. In ‘Bloody Week’ in May, he fought against government troops. 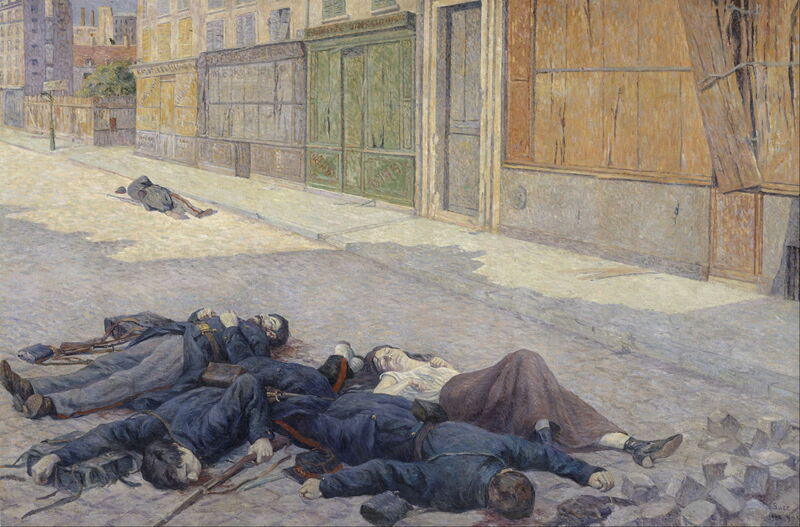 When the Commune was suppressed and broken, he was captured, taken to Montmartre, tortured and blinded by a mob, and finally shot, as shown here. Maximilien Luce (1858–1941), La Gare de l’Est (1917), oil on canvas, 129.5 x 161.5 cm, Musée de l’Armée, Paris. By Ji-Elle, via Wikimedia Commons. Luce was one of the most expressive artists (who was not a war artist) to show scenes relating to the First World War. 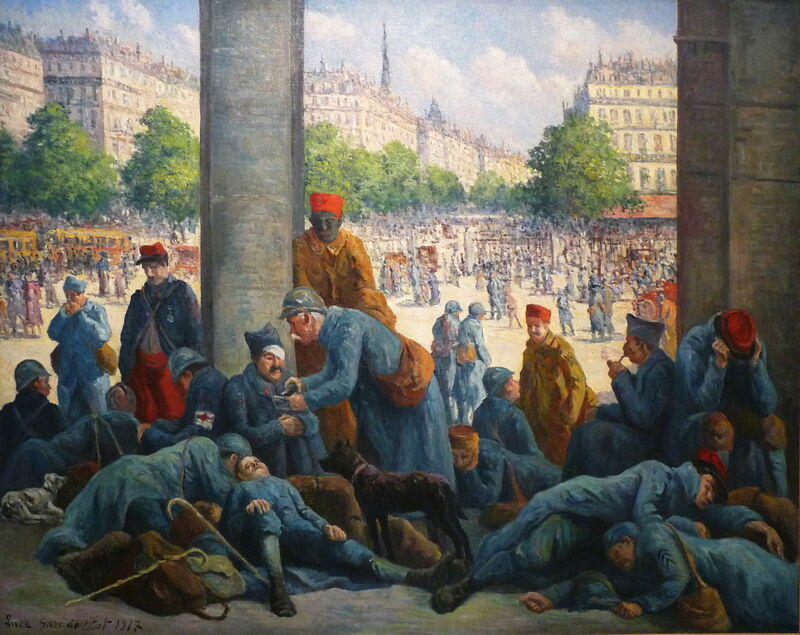 In his La Gare de l’Est (1917), a collection of wounded and battle-weary soldiers are shown at the entrance to this large Paris railway station. Maximilien Luce (1858–1941), The Gare de l’Est in Snow (1917), oil on canvas, 130 x 162 cm, Musée de l’Hôtel-Dieu, Mantes-la-Jolie, France. Wikimedia Commons. 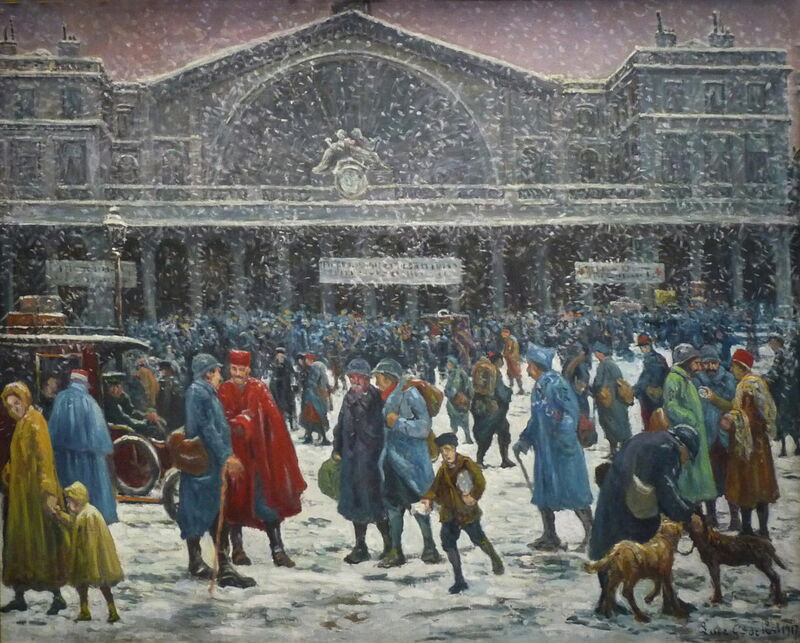 The Gare de l’Est in Snow (1917) is even better-known, and a classic painting of falling snow in a large city. Luce continued to paint after the First World War, and finally died in 1941, during the occupation of Paris. Although his career had been long, and had produced many excellent paintings, it was not until 1997 that his work appeared in a major retrospective exhibition in America. He remains badly underappreciated today. Posted in General, Painting and tagged Carolus-Duran, Impressionism, Luce, Neo-Impressionism, painting, Pissarro, Post-impressionism, Seurat. Bookmark the permalink.